Senator Ovie Omo-Agege, representing the Delta Central Senatorial District, has lambasted the House of Representatives for approving his suspension over alleged involvement in the invasion of the Senate chamber and mace snatching. The senator, in a statement he personally signed on Sunday entitled, ‘My Advice to the House of Representatives on its Purported Resolution to Suspend Me: Eat It or Better Still, Shove It’, also called President of the Senate, Bukola Saraki a “dictator”. 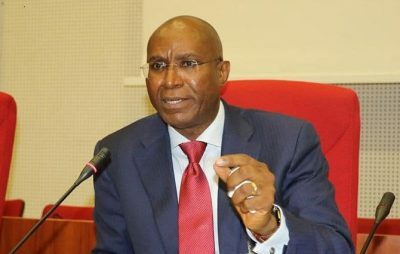 The Senate had on April 12, 2018, suspended Omo-Agege for 90 legislative days for dragging the chamber to court over the amendment to the Electoral Act 2010 which seeks to reshuffle the sequence of polls during general elections. Omo-Agege said: “Without much ado, I state without ‘equivocation’ whatsoever that the purported House resolution is just an act of utter lawlessness by one ordinary, first among equals in the Senate, who prides himself as a most intolerant dictator. The Urhobo people that I represent with honour in the Senate do not respect oppressors or dictators. “As a good student of Constitutional Law, I am unlike the one who knows nothing about the law yet misuses our legislative processes and instruments to violently violate my rights as a Senator of the Federal Republic duly elected by my people to represent them in the Red Chamber just like him. The lawmaker pointed out that with Sections 88 and 89 of the Constitution, the National Assembly had no power whatsoever to investigate a crime. Omo-Agege noted that there were several judicial decisions that legislative houses could not suspend their members. He added matters of his suspension by the Senate and National Assembly’s investigation of the mace theft were before the court, making the action by the House subjudice. He said, “It is elementary that parties are not supposed to take steps to foist fait accompli on a court that is already seized of issues between such parties. But some would rather turn the Senate into a Banana Republic by arrogating to themselves powers they do not have and acting with disgusting lawlessness and brazenness.